If you’ve ever read this site before, you know that my BFF moved to Korea in August of this year. Her and her husband have been having a great time teaching over there, but she does miss home. Among the things that she’s craving are: fruit snacks, McDonald’s Holiday Pie, brownies and peanut butter. So for Christmas I wanted to give her baked goods. Trouble is, the shipping time can be up to 3 weeks. So, I thought I would make her a cookie mix so she could make them herself. That plan was foiled too since she only has a tiny toaster oven in her apartment. Then, a bloggy friend suggested maybe canned cake. The basic premise is to make a cake in a canning jar and seal it while hot. The heat causes baked goods to vacuum seal as they cool and will last up to 2 months unopened. I loved the idea, but Amy and I share a general dislike for cake. But what about cookies? Hot cookies in a hot jar with a hot lid should do the same thing- right? Right! So, I sent Amy brownies, and peanut butter cookies in a jar. Then to satiate her love of the McDonald’s Custard pie (a sugar cookie crust with vanilla custard) I made sugar cookies and sent some vanilla pudding cups. This method is great for friends and family that live far away, or for loved ones in the military. It would also be a great wedding favor since people could keep them for a while and eat as they like. And it was so easy! 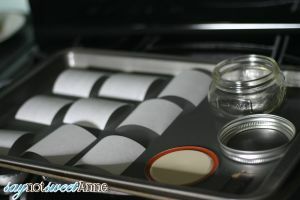 NOTE: It is important to note that while these cookies are stored in a heated canning jar, they are not canned. My goal was to create a shelf stable cookie that would be “fresh” when Amy received them up to a month later. 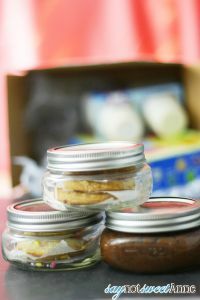 The sealed canning jar keeps air from traveling around the cookies, and prevents them from drying. This is a method to prevent staleness, not to preserve baked goods. Wide mouth canning jars, rings, and lids. The process is really simple. 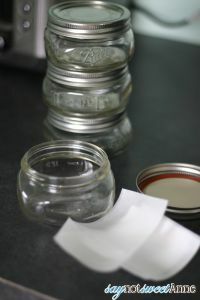 Sterilize your jar, rings and lids as normal. 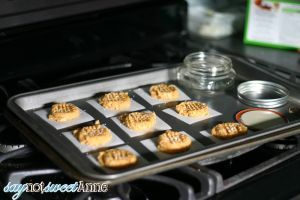 Heat your jar, lid and rings in the oven as you bake your cookies. 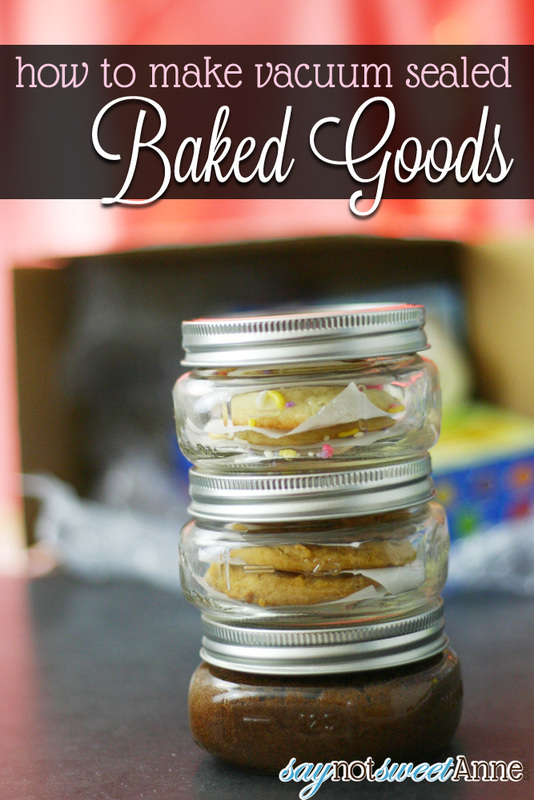 Then, once the cookies have cooled enough not to fall apart, just stack them in the jar. I baked my cookies on parchment and stacked them that way too to prevent sticking. Once the jars are cool, the seal button should be down. That means they sealed! I’m glad you think so!! Oh my, what a great idea! I could send several jars of cookies to my son in college! Of course, I’m sure he would eat them all the same day, but hey – it’s the thought that counts, right??!! Totally! I think Amy’s already eaten all of hers. In theory they should be good for a couple of months in the jars- but no one can wait that long to test!! Thanks for the tip! I’ve edited the post to make it more clear this is a method for keeping cookies from going stale in shipping, and not one to preserve them in a sterile environment for eons. The heat is only used for vacuum sealing, and not for sterilization as in traditional canning. Thanks!! That’s an awesome idea!! I can only imagine how happy she was to receive the treats! Love this! Did you bake brownies directly in jar? I did, but I can’t tell you how they turned out. There are plenty of other tutorials specifically for cakes and brownies. I love the idea and the presentation. Going to surprise my mum….thank you. So dumb question. I’d love to send these in a care package.. but how does sealing them in this way prevent them from molding?? I’ve never canned or anything so this is new.. and my hubby is funny about food so I just want to be able to answer him that they truly are fine, lol Thanks! I would add an oxygen absorber to ensure sealing. I wonder if I could do this in a larger jar with a small loaf of bread. So I my husband is deployed over seas right now, and his ULTIMATE favorite baked goods are Apple Pie Cinnamon Rolls. Do you think that canning them in this same way would work? I am trying new things. I have sent cookies, cake, and brownies. However I feel like he’s getting a little bored with those! And would I need to can the icing separately, or do I just pour it over the top and hope for the best?